Experience the thrill of learning extreme sports at the Youth Activity Park in Dardenne Prairie. When you register for group, private and semi-private skateboarding, BMX and scooter classes, you'll learn how to skate and ride the concrete wave on the largest outdoor skate park in Missouri. The 25-acre Youth Activity Park takes extreme sports to the next level with its state-of-the-art, 33,000-square-foot skate course that offers challenges for every skill level. Outdoor lighting, a street course, three bowls—beginner, intermediate and advanced—and snake run scattered with ramps, gaps, and hubbas, make it the perfect place to learn extreme sports in a supervised environment. Whether you’re new to the extreme sports scene or want to take your skills up a notch, you’ll get exclusive training from experienced skaters and riders at Scooter 101 and 102, Skateboarding 101 and 102, and BMX 101 and 102. Each session is unique to your needs and is designed for youth and adults ages 4–18. • Scooter 101 and 102 lessons are scheduled March 5–19, May 7–21, July 9–23 and Sept. 3–17. Scooter 101 is for those who are new to riding scooters and want to learn the fundamentals of scooter riding. It teaches basic components of riding and skate park use; proper riding stance, pushing, and balancing; rolling down small to medium hills, bowls, and transitions; and equipment maintenance and tuning. If time permits, the class will cover more advanced skills and tricks. Scooter 102 participants learn intermediate-level bowl and transition riding; intermediate-to advanced-level trick and grinding skills; fundamentals to improve overall riding skills; and skills individual riders want to learn or improve. Scooter 101 starts at 5 p.m.; Scooter 102 at 6 p.m. Each class meets for 45 minutes on three consecutive Tuesdays and cost is $35 per session. • Skateboarding 101 and 102 lessons are scheduled March 6–20, May 8–22, July 10–24 and Sept. 4–18. Skateboarding 101 is for riders new to the skateboarding scene who want to learn the fundamentals. Participants learn skateboard and park basics; proper stance and board adjustments; how to push, keep balance, and make simple turns; rolling down small to medium hills and banks; and board equipment maintenance and tuning. If time permits more advanced skills and tricks can be covered. Participants at Skateboarding 102 learn intermediate level bowl and transition skating; basic to intermediate grinding and flat ground trick development; and fundamentals to improve skater’s overall riding skills. Skateboarding 101 starts at 5 p.m.; Scooter 102 at 6 p.m. Each class meets for 45 minutes on three consecutive Wednesdays and cost is $35 per session. • BMX 101 and 102 lessons are scheduled March 7–21, May 9–23, July 11–25 and Sept. 5–19. BMX 101 is for riders who are new to the BMX scene and want to learn the fundamentals of BMX. Participants learn BMX riding and park basics; pedaling, turning, and adjusting; riding small bowls, hills and transitions; and bike equipment maintenance and tuning. If time permits more advanced skills and tricks can be covered. BMX 102 is for intermediate riders who want to take their skills to the next level. Participants learn intermediate-level bowl and transition riding; dropping-in, riding ramps and grinding; intermediate to advanced trick development; and fundamentals to improve overall riding skills. If time permits more advanced skills and tricks can be covered. BMX 101 starts at 5 p.m.; Scooter 102 at 6 p.m. Each class meets for 45 minutes on three consecutive Thursdays and cost is $35 per session. Anyone taking lessons or participating in extreme sports activities in the park must wear a helmet and have a valid waiver on file at the Youth Activity Park. Any session canceled due to inclement weather will be rescheduled. Space is limited for group lessons. Private and semi-private lessons also are available year-round and cost $80 for private and $60 for semi-private. Admission to the park is free in 2019. 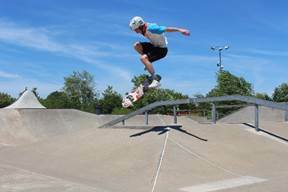 To register for skateboarding, BMX or scooter lessons, visit http://bit.ly/2019ParkRegistration online and choose the lessons you are interested in taking or call the park at 636-561-4964.